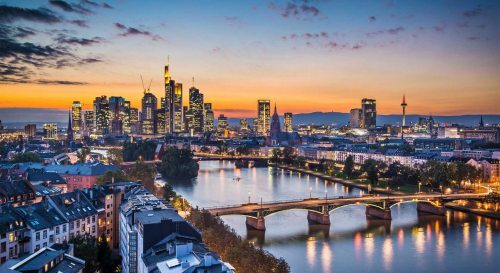 United Airlines and Lufthansa are showing non-stop flights from Seattle to Frankfurt, Germany in spring 2018 for $549 to $579 CAD roundtrip including taxes. Lufthansa is often ranked somewhere in the top 10 of airlines worldwide, and would be the ones I would focus on. It should also be noted that Lufthansa has been known on rare occasion to drop the price of their non-stop flights from Vancouver to Frankfurt down to $750 CAD roundtrip. When Vancouver to Frankfurt is priced at $750, it's probably not quite as worth the drive to Seattle for these cheap flights. But Lufthansa's Vancouver to Frankfurt flights are often priced at closer to $1200+, and the cheapest are currently Air Canada's flights for $1066..
Look for the dates that are $640 CAD roundtrip. So far I've had better luck finding the Lufthansa flights on Skyscanner. Note: After your search completes, you may want to select 'direct' or 'non stop' in Skyscanner or Momondo. Also note: While Momondo is estimating the price in $CAD, the booking sites that are showing these flights after you click through will often be in $USD. So watch out for that, and do the exchange rate math. vancouver, yvr, flight deals, europe, frankfurt, germany, fra, central europe, western europe, munich, muc, lufthansa and united airlines.